It is snowing here, again. And the kids are home, again. And we can't go anywhere, again. How do you make the best of another winter storm? Now obviously the best way to survive a winter storm is to receive a letter informing you that your long-lost Great-Aunt Gertrude has left you a fortune. Probably that fortune will be dependent on your solving some convoluted mystery that will find you, at some point, standing in an abandoned library as your candle gutters out and you hear footsteps slowly creeping up behind you. But on the plus side, you will have Aunt Gertrude's fortune and you can fly off to a beautiful island somewhere and lie on the beach while dreaming up ways to spend the rest of her money. But now I want to know, did I scream when my candle finally flickered out? What was I searching for in the abandoned library? Were the footsteps those of the villain, come to hit me over the head and steal the mysterious paper I just found in the book I am holding? Or are they the footsteps of the hero, returning from his own investigations in the abandoned tower? What did he find in the abandoned tower? So many unanswered questions. 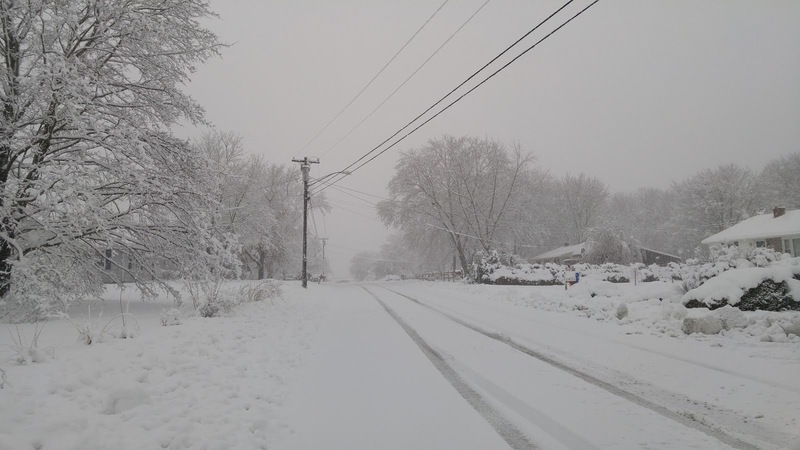 With no suddenly inherited fortune, what can be done to survive the second winter storm in four days? If possible, provide yourself with a teenager. Why would you want to do that? Don't they eat a lot? And sleep a lot? And aren't they kind of mouthy? Well, yes, all those things can be true. However, teenagers also shovel snow. Shoveling snow is only fun for approximately two and a half minutes. After that it is just work. If you have a teenager you can lean on your snow shovel and watch him work, and then, after a suitable interval, you can murmur a few vague words about the necessity of checking something in the oven and wander back into the house. And believe it or not, your teenager will be relatively happy, because if he works hard enough he might earn a little extra money. Teenagers are always interested in earning a little extra money to finance their various hobbies. Secondly, provide yourself with a medium sized child. Too small children don't work as well. They can't put their own snow clothes on, they realize they need to go to the bathroom as soon as you put the last mitten on, and they are always convinced their socks are wrinkled in their boots. Medium sized children don't do any of these things. 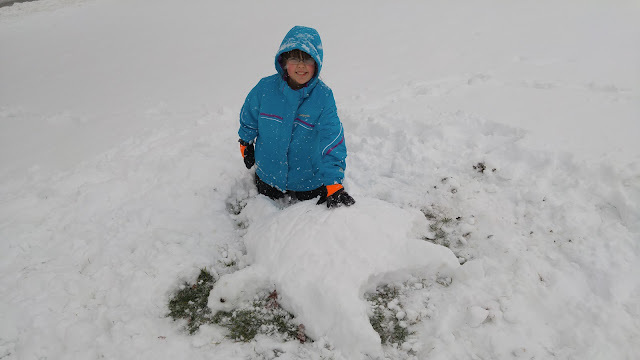 They dress themselves, they play outside by themselves, and they are absolutely thrilled when you go outside to build a snow turtle. Yes, a snow turtle. The snow was too wet and heavy to make snowballs big enough for a snowman. She insisted I photograph the turtle and insisted I put it on my blog. So basically, you can thank her for this post. She also is trying to convince me that a whole post about the cat is a good idea. So far, I have resisted, but you have been warned. If book mail happens to be delivered on a snow day you might manage to forget that it is snowing. This happened to me on Friday. Life was good on Friday. I am waiting for a couple of other books. If more books can be delivered today during another snowstorm, then I am indeed blessed among humankind. You don't need to actually read any of the books that get delivered. They are there to gloat over and possibly photograph because that is the strange kind of thing you do now. Reading can go either of two ways during a snowstorm. Either you decide to start that 800 page Victorian novel that you have been meaning to read or you read all the light and frivolous books in the house. You know the ones, they involve abandoned libraries, guttering candles, and long-lost aunts. Snow days always require large amounts of your hot drink of choice. This is because a large portion of the day should be spent sitting on the couch, looking out the window at the swirling flakes, and holding a hot mug in both hands. Ideally, you should be curled up under an afghan at the time. And now, if you will excuse me, I am going to drink another cup of tea while waiting to be contacted by long-lost Great-Aunt Gertrude's lawyers.